A central concept underpinning the theory and analytic narratives is the notion that centers of power—the regime’s institutional, social, and foreign bases of support—are fundamental to regime stability. The chapter explores the concept of centers of power and the relationship of centers of power to regime stability, with specific attention to the empirical application of this concept. 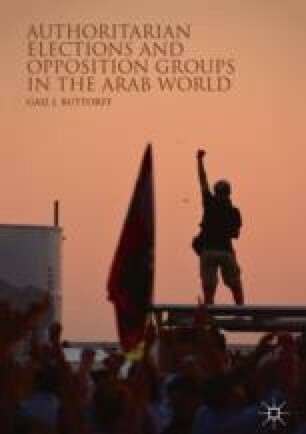 In this chapter, Buttorff also discusses the set of common centers of powers that we observe in the Arab world, such as the military and Western powers. She then identifies the centers of powers in Jordan and Algeria that will be used in the case studies to explain opposition beliefs in the stability of the regime and the impact of these beliefs on electoral strategies over time. Tell, T. (2015). Early Spring in Jordan: The revolt of military veterans. Carnegie Endowment for International Peace. Retrieved from https://carnegieendowment.org/files/ACMR_Tell_Jordan_Eng_final.pdf.